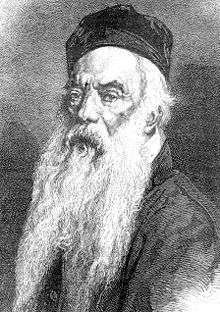 François Rude (4 January 1784 – 3 November 1855) was a French sculptor. He was the stepfather of Paul Cabet, a sculptor. Born in Dijon, he worked at his father's trade as a stovemaker till the age of sixteen, but received training in drawing from François Devosges, where he learned that a strong, simple contour was an invaluable ingredient in the plastic arts. In 1809 he went to Paris from the Dijon school of art, and became a pupil of Pierre Cartellier, obtaining the Grand Prix de Rome in 1812. After the second restoration of the Bourbons he retired to Brussels, where, probably owing to the intervention of the exiled Jacques-Louis David he got some work under the architect Charles Vander Straeten, who employed him to execute nine bas-reliefs in the palace of Tervuren, now destroyed. At Brussels Rude married the painter Sophie Fremiet, daughter of a Bonapartist compatriot to whom he had many obligations, but gladly availed himself of an opportunity to return to Paris, where in 1827 a statue of the Virgin for St Gervais and a Mercury fastening his Sandals (now in the Musée du Louvre) obtained much attention. 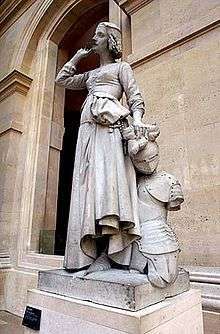 His great success dates, however, from 1833, when he received the cross of the Legion of Honour for his statue of a Neapolitan Fisher Boy playing with a Tortoise (now in the Louvre), which also procured for him the important commission for all the sculptural frieze ornament and one group on the Arc de Triomphe, in Paris. 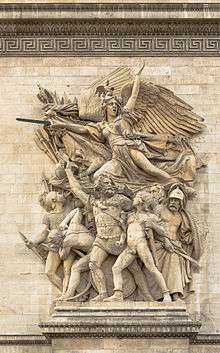 This group, Départ des volontaires de 1792 (Departure of the Volunteers of 1792), also known as La Marseillaise, a work full of energy and fire, immortalizes the name of Rude. Among other productions are Napoleon Awakening to Immortality (Musée d'Orsay, Paris), the statue of the mathematician Gaspard Monge (1848), Jeanne d'Arc, in the gardens of the Luxembourg (1852), a Calvary in bronze for the high altar of St Vincent de Paul (1855), as well as Hebe and the Eagle of Jupiter (Musée des Beaux Arts, Dijon), Love Triumphant and Christ on the Cross, all of which appeared at the Paris Salon of 1857 after his death. An important pupil of Rude was Jean-Baptiste Carpeaux, who subsequently executed his own interpretation of a Neapolitan Fisher Boy, a popular subject at the time. The Musée Rude, Dijon, inaugurated in 1947, is devoted to plaster casts of his works that were acquired by the city of Dijon, between 1887 and 1910; it is housed in the transept of the 11th-century church of Saint-Etienne in rue Vaillant. ↑ Rude's portrait busts of Devosges are conserved in the Musée des Beaux Arts, Dijon. (Illustration). ↑ L. de Fourcaud, François Rude, sculpteur: ses oeuvres et son temps 1904, pp 100-12, noted in Symmons 1973:595, note 25. Wikimedia Commons has media related to François Rude.